Dolphin Tower: Can We Get Over It? Dolphin Tower represents one of two things: the world's scariest condo owner's nightmare, or an investor's dream, depending on where you were in June of 2010. If you were sitting in your condo, overlooking one of the best views in downtown, but tripping over a gaping crack in the floor of your home; or if you were the President of the Condo Association of the building, not realizing how many hours, weeks, months, and years you were about to spend trying to literally and figuratively pull a building out of a black hole; or if you were a snowbird home safe for the summer getting a phone call from said President that your second home was being evacuated... then you probably fall into the former category. Dolphin Tower was many people's dream-turned-reality: center of downtown with views for miles, all at a relatively reasonable price-point thanks to the age and style of the building. Retire early, enjoy life at the beach yet in a cultural epicenter. Could it get any better? Well, it certainly could get worse. In the summer of 2010, dream-turned-reality became dream-turned-nightmare when the 36 year old building began the process of collapse. Cracks appeared in floors and walls, temporary support was installed, and the building was evacuated. What once was a premier address in Sarasota quickly became a derelict liability. In addition to the obvious structural problems, it was quickly discovered that the building fell below current wind shear standards, and might likely topple right down in the event of even a low category hurricane. Many owners quickly went upside-down, as their responsibility for monthly condo fees (and mortgage payments, if mortgaged), rent for a temporary living place, storage for possessions, and gigantic special assessments for building repairs veritably ripped the money from their pockets. Many foreclosed and several sold for nothing more than closing costs; roughly two-thirds of the building turned over during what ended up being a five-year-long renovation project. Special assessments for the renovations and repairs will continue through until the year 2020. The View from the Top of Dolphin Tower remains one of the best in the city. Ten years ago, at the height of the market, before the recession, Dolphin Towers properties were selling for an average $425,000. Five years ago, in the midst of the chaotic renovation, the average price dipped to a staggering 10% of that. TEN. PERCENT. The 2012 average sold price in the Tower was just $47,137, as owners sought to unload what they saw as a money pit with no bottom. Now, 10 years post-recession and 2 years since the first occupant was able to move back in, the average sold price has rebounded back up to $380,690. There are currently 33 condos on the market at the moment, some being sold sight-unseen as they are not yet fit for occupancy, and some with Certificate of Occupancy already received. The price range of those available is $279,900 to $695,000. A recent renovation on Dolphin Tower's 14th floor. Given that the building has undergone one of the most rigorous and complete renovations in recent memory, we know it has the potential to be a solid part of the downtown real estate market once again. Many residences are now beautifully renovated and still you can get a lot for your money in Dolphin Tower. 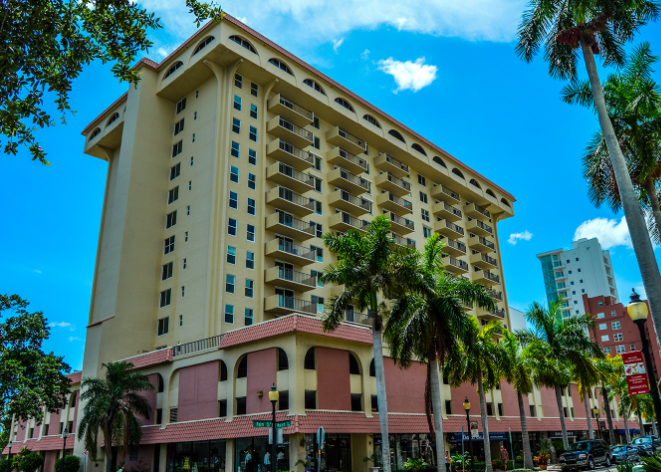 It remains one of the best-positioned buildings in downtown--Palm Avenue Shoppes beneath it, across from the water and the Marina, and in walkable proximity to everything. But will buyers ever trust the building again? Only time will tell. The factual content for this information was taken from this article in Sarasota Magazine, as well as by compiling data from many years in the Mid-Florida MLS.